Besides the "reference" material relating to NG_PwrDemand_0", etc, which follows, there is another page which attempts to address sundry odds and ends broadly relating to powering a NoviceGuard. That will open in a new tab or window... just close it to come back to here, if it isn't what you want. This follows on from an introduction! In the hope of providing a standard frame of reference, some power demand/ supply scenario "names" have been created. They create hierarchy. The names are start "NG_PwrDemand_" (for NoviceGuard Power Demand...) to distinguish these terms from those associated with other hierarchies. NG_PwrDemand_0 will be for a NoviceGuard with almost nothing (see below) plugged into any of the daughter board sockets, nothing plugged into the twelve way connector, no power other than that coming in via the programming cable, and with the LEDs on the input lines either simply absent, or disabled by leaving jumpers JN0 through JN3 open. Please don't underestimate the use which can be had from an Arduino plugged into a NoviceGuard configured for NG_PwrDemand_0. I developed a program to control a loom with one. I said "almost nothing plugged into the daughter board sockets". For NG_PwrDemand_0, you do need 10k resistors between the center and bottom pins of SkN1 and SkN3. This is discussed in more detail at the page on inPUR, inPLR pull up resistors. NG_PwrDemand_1 is almost the same as NG_PwrDemand_0, but carefully selected daughter boards may be plugged in. And even then, then numbers of them must be limited. 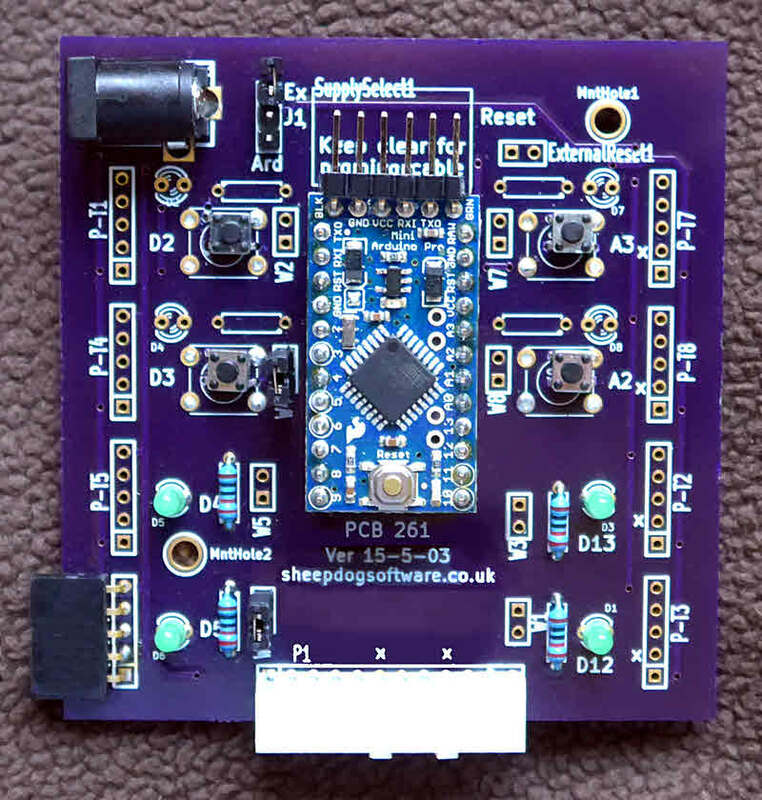 If you are willing to connect a power supply to the NoviceGuard via a barrel jack (or wires) connected to SkNG_PwrDemand_2 a vast range of new opportunities open up, because you are no longer powering everything through the Arduino. As was true for the first time under NG_PwrDemand_1, under scenario NG_PwrDemand_2, users may plug daughter boards into the NoviceGuard. (This is an illustration of a general rule. Anything you can do in a "lower" power demand scenario is allowed in a "higher" scenario. It will still be necessary to take some care over power demands. More to be said on this. This scenario is reserved for situations involving modules plugged into the twelve way connector on the bottom edge of the board. I can't, off the top of my head, think of any particular power demand considerations unique to using the twelve way connector... but it is early days. To work in NG_PwrDemand_3 conditions, the same requirements as those for NG_PwrDemand_2 apply.